Pinterest plays a very important role in today’s digital marketing. According to the study done by Millward Brown, Pinterest has great influences in the purchase decision as more than 85% of the Pinners have used Pinterest to plan or research before they purchase something. If you’re using Pinterest to promote your business, then you need to be using Rich Pins. Rich Pins are the enhanced version of regular pins. Unlike the regular pins which would only display an image along with the description that the pinner entered, Rich Pins include extra information from your website including real time pricing, availability, title, and meta description. These extra information will help pinners to decide if they want to come to your website for further information. Generally, Rich Pins will enjoy higher visibility and clicks compared to the regular pins. 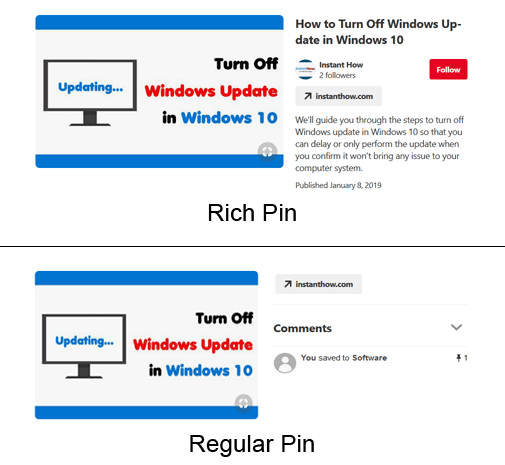 In case you’re confused the difference between a Rich Pin and a Regular pin, you may refer to the example below. As you can see, the Rich Pins provide more details to the reader and it tells them much of the information that they can expect before they click on the link. So I guess you would be interested to add Pinterest Rich pins to your Blogger blog now. 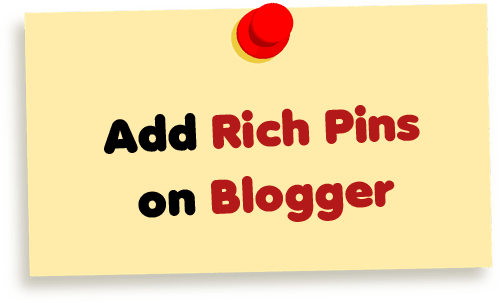 If you follow the instructions given by Pinterest, there is not much information available on how to setup Rich Pins on a Blogger blog. That is why I started this article to help you to add Pinterest Rich Pins on your Blogger blog. Login to your Blogger account as you normally would. From your Blogger account, click on the Theme link on the left. At this stage, you may consider to perform a backup of your blog first before you proceed further. Then, click on the Edit HTML button. After opening the HTML template editor, click anywhere inside the code area and press CTRL + F buttons (Windows) (or CMD + F for Mac). This will open the search box. Copy and paste <b:includable id='post' var='post'> in the search box and press enter to search. Click on the small black triangle to expand the codes. Copy and paste the following codes right after <b:includable id='post' var='post'>. Click on the Save button to Save the template. Please note that Pinterest will be using your post description for the Rich Pins. So, make sure that you don’t leave the post description empty every time when you are publishing a new post. Now go to the Pinterest Rich Pins Validator page. Enter any of your blog post's url and click on the Validate button. You should receive a success message saying that your Pins have been validated. Lastly, select HTML Tags and click on the Apply now button. It could take up to a week for Pinterest to approve your Rich Pins application but in my case, it was approved after a few hours of the submission. Pinterest will be sending you a confirmation email once your application is approved.